Kumara Purnima also known as Sharad Purnima and Kojagiri Purnima, is one of the most important festivals of Odisha. The festival follows Dussehra festival and is celebrated on the full moon day in the Hindu month of Aswayuja. Kumara Purnima is basically celebrated by young girls of marriageable age and by the newly-wed women. The celebration of the festival is very much similar to Atla Taddi celebrated by the Telugu people of Andhra Pradesh. This is one of the most awaited festivals for the young girls of Odisha as they can enjoy the whole day singing, dancing, playing and having fun. Girls / women who celebrate Kumara Purnima get up early in the morning before sunrise, complete all the chores, dress themselves in new attire and get ready for the pooja. They perform the ritual called 'Johni Osa' (johni means ridge gourd in Odia language). The young girls offer 'liya' i.e popped rice along with johni, cucumber, banana, coconut and betel nut to Sun god as 'Onjoli' (anjali i.e offer). After this, the young girls observe fasting for the whole day. They enjoy the whole day singing / playing with their friends and relatives. The young girls enjoy 'puchi khelo' - a unique / special game played by the girls of Odisha. In this game, the young girls sit with squatted legs in a typical position and keep twisting their legs from one side to the other while both the hands are moved front and back as a reflex action. They gradually pick-up the speed of twisting. After merry-making the whole day, the young girls refresh themselves in the evening and eagerly wait for 'Johno' i.e the full moon to rise in the eastern sky. 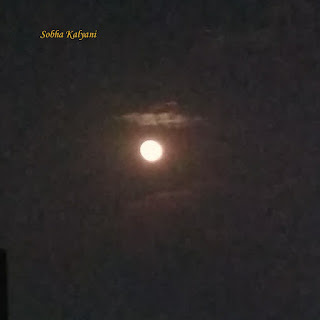 It is said that the full moon on this day looks the most handsome and the moon comes closer to Earth. Young girls who observe fasting the whole day see the rising moon, offer their prayers and offer prasad i.e food specially made of popped rice, sliced bananas, grated coconut, black pepper, honey / jaggery and ghee (clarified butter). In some regions this food item is known as 'Chanda Chakata'. The young girls eat this prasad after offering to Moon. It is believed that by doing so, the girls of marriageable age will be get a suitable / handsome groom. On this day, the people of Odisha perform Gaja Lakshmi Puja. In some regions of the state idols of Goddess Gaja Lakshmi are installed in community pandals and puja is perform at community level. It is believed by the people of Odisha that Kumara Swamy (also known by the names Kartikeya, Muruga, Subramanya) - the younger son of Lord Shiva and Parvati - was born on this day. Hence the festival is celebrated as Kumara Purnima. Even Lord Indira is worshiped on this day in some regions of the state. Kumara Purnima is celebrated in a unique way at Jagannath temple in Puri. On this day temple priests play the game of dice in two teams on behalf of Lord Jagannath and Goddess Lakshmi Devi. The Hindu month of Kartik starts in those regions who follow the lunar calendar.